In this Depositphotos review, we’ll discuss how you can buy cheap photos like a pro. 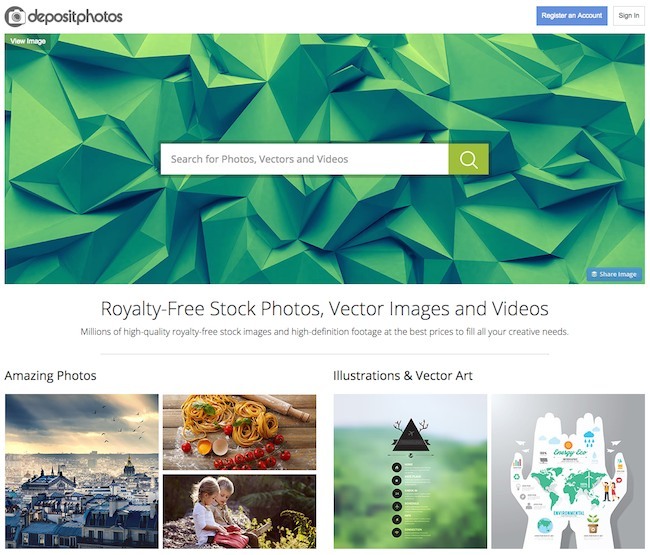 Depositphotos is a stock photography agency that provides images to customers willing to pay for them. This can be done through credits or a subscription plan. Stock photography consists of images that can be used for a variety of purposes. It’s commonly used in web design, ebook cover art and blogs but can be used for many personal and commercial ventures that require pictures. There are some restrictions to the use of the images. When you buy cheap photos from any stock photography agency, you must be clear on the type of photograph that you’re buying, and the license that impacts its usage. All images available at DP are royalty-free, which basically means that the image can be used for digital or print applications. It can be used in advertisements, presentation, movies or television. In print, it can be used for shirts, newspapers, labels or calendars. It cannot be used for items that will be resold where the sole selling point is the photograph itself. Users could not create their own site to resell the pictures, and the image cannot be given out for free. For example, if you wanted to create a calendar with pictures, the pictures play only a minor role in the purpose of the product. That would be allowed. The standard license has no end date. It’s good for a lifetime of use. With over 16 million stock photographs, you’re not going to stumble across the perfect photograph without some help. There’s a powerful search function in DP that allows users to find the photo they need. You can search within the photo category or the other categories like vectors, editorial or videos. You can also search in all categories at once using the search bar. While you could browse photographs for days and days, if you have a specific type of photograph in mind, you’ll need keywords. Advanced keyword search can help narrow down the possibilities too. You can enter keywords to exclude, the orientation of the photograph, the image size and the overall color tone of the photograph. Think about the keywords that will help you find the perfect photograph for your project. Credits are available for purchase. They start at 30 credits for $32. Each photograph has a credit amount based on the size of the photograph. Small file sizes cost less money. The downside is that they cannot be altered very much without losing resolution and becoming pixelated. Most images should be large to allow them to be resized for different mediums. Subscription plans are great for anyone who needs more than one or two photos. If you have a blog, website or project that requires photographs constantly, the subscription plan is perfect. You can choose one month for $69. With the one month plan, users can download five images per day of any size. 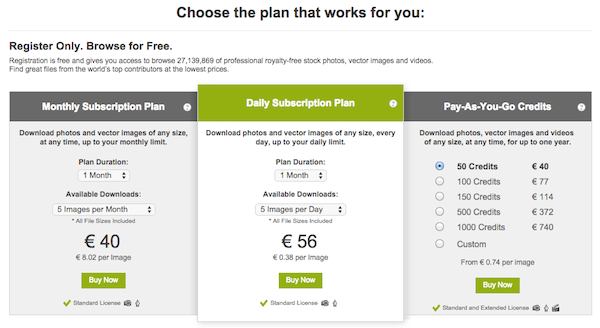 A three-month plan costs $199 and includes five images per day as well. The downloads are available as soon as you choose a plan or buy credits and pick the size of the photograph. The browser you use will dictate where the files are saved, and you can change that at any time in your browser’s settings. After purchase, the photograph will still be available at Depositphotos for download up to a year later. If you’ve lost the photograph for any reason, check the buyer menu for your purchased file folder. It will allow you to download the same photograph again as many times as needed. You won’t have to pay for the download again for one year. This Depositphotos review should help you navigate through the world of stunning photographs and download like a pro.